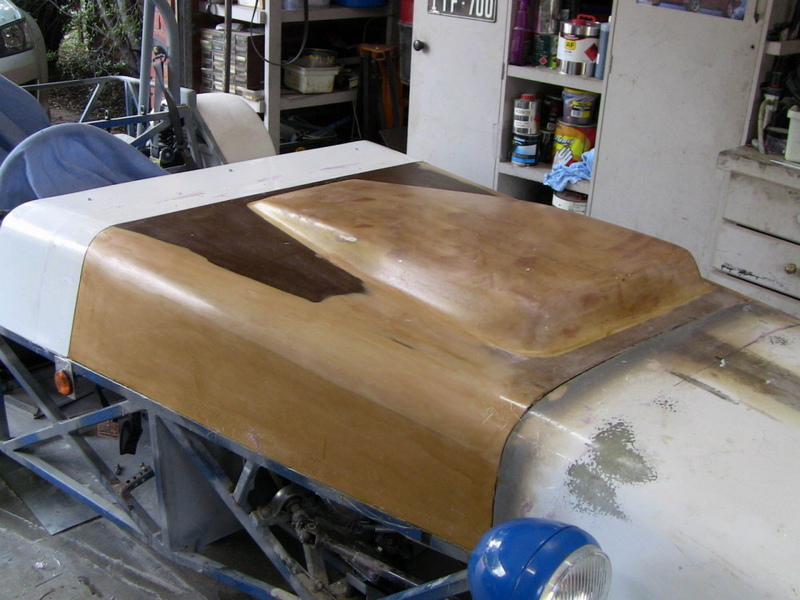 The raised centre section was achieved by firstly covering the engine with plastic and then pouring large quantities of "Plaster of Paris" onto the area until there was sufficient material to build the scoop. The plaster was then filed and sanded to provide the desired shape. Sounds easy but it was a long process due to the very long time it took the Plaster of Paris to dry. Unfortunately it was about 50mm thick in some places and it had to be left for 2 weeks before it was dry. However, once it dried the sanding and shaping could then be finished. If I did this again I would make sure that I reduced the thickness of the plaster by building a basic cardboard or timber frame and then spreading a thinner layer of plaster over that. Oh, and the reason behind the "toffee" colour was the use of "Shellac" to seal the porous surface of the timber, body filler and Plaster of Paris.